The contemporary cities made of hybrid cultures and ethnic groups make us experience new forms of emotions. Both unprecedented from being related to new tribal constructions, and however still deeply related to ancient memories of us, as descendants of travelers without land, as both foreigners and natives, as free and endangered human beings. Generative nights wants to convey feelings, visions, sounds, and sufferings that are produced by such hybrid urban environments, particularly vivid at night. It is an exploration of a dark urban world in which humanity struggles with infinitely replicating micro-machines and curses far beyond human control. Cities built during the second half of the 20th century, were often based on some kind of idealistic urbanism, in which they were envisioned as ideal representations of micro-worlds with some symbolic content and theory-based division of space and functions. Generative nights starts with a formal harmony of lines and compositions that slowly develops across the ground. The ideal and harmonious development is progressively contradicted by human traces, which, like aboriginal paths associated by ancient tales, have their own rights and deep meanings. Progressively the population inhabits the designed space, without necessarily complying with the initialroad-map. Typical suburban clichés are displayed related to animal-like compulsions in a city at night, about fight, love and fear. Subtle traces and symbols are used as triggers for the future development of the story. The background thread of the screen is made of cellular automata which, when they are not “disturbed” by human traces, develop aesthetically pleasing patterns typical of generative art... When confronting graphical stroke, they turn into fine lines of crawling pixels like the mob strolling a crowded urban place seen from a helicopter that we, as spectators of the performance, collaborate in some form of surveillance. The visuals and a background sound sequences are synesthetically coupled with the graphics by equipping the visual display with sensors. They capture the "light" on the surface and convert it into sounds according to their positions on the display. Just think of the graphics as a huge sequencer of one million interconnected cells with light sensors that capture the activity in some selected places of the visual sequencer. In the second part of generative nights, the city is seen from the ground level and we get progressively immersed into its phantasmagoric development. The rulers of the city are represented as giants dominating the buildings as if they would embody the power that such an urban life can be submitted to: police, politics, gangs, syndicates, religious leaders, personal myths and deep drives... At first they come in the form of totems evoking monsters or birds: Are they really rulers of our night life, or just mediums whose energy could empower us through the demanding journey that we are about to make towards the end of the night? The haunting vocals of Feminine Path turn these gigantic primitive totems into goddesses who watch over of the city at night. Moved by the shamanic rhythms of the loops, luminous vestals, dancers in the dark, and flying guardians, half yamakasi/half angels, haunt the buildings while the city asleep traverses its dreams of fame and wrath. Facing the curse of divinities, the background mob turns progressively into a rebel nocturnal crowd, echoed by haunting rhythms, while the angular shadows of mysterious spaceships traverse the sky. The third part of the performance brings the drawing machine into play and reveals the performer's limbs but fails as Deus ex Machina. The audience can more clearly perceive the role of the drawing artist, and his direct physical commitment in the production of the images. Digital effects promote the graphics to the role of signs and symbols because of their higher degree of abstraction and organicity. After clearing the skies from their threat, the hand of fate traps the melancholic solitary wanderer, her memory is nothing but a vanishing tattoo on a dusty ground. Floating creatures rescue the lost soul carrying her to the sky through the energy of a sacred animal above the ruins of a devastated city. The performance ends up in an apocalyptic whiteness produced by a tumor-like growth of the human traces left by the drawing. Simultaneously the song that was carrying the dead towards a hopefully more peaceful parallel world, ends up covered by a sonic chaos produced by the overwhelming generative rhythms. The audio performance is a combination of singing, digital instruments and digital effects together with looping and additional effect pedals. The graphical performance is a combination of drawing, first on a tablet, and then on paper captured by a camera, and digital effects of particles and cellular automata. The graphical work is a fragile and versatile association of human control through manual drawing, and generative effects for adding more graininess and fluidity to the strokes. The sound and drawing are coupled and intertwined in many ways. 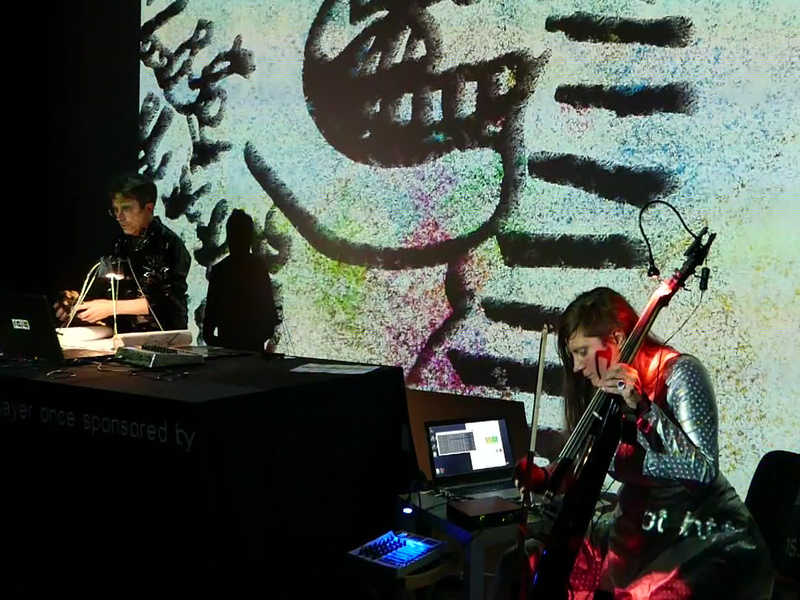 Generative nights is the first project of Lola and Yukao Meet in which the drawing directly produces sounds. This has been made possible by equipping the display screen with virtual sensors which convert the visual signal into audio events by using visual events control a sample-based sound synthesizer. Conversely the pulsation of the music, its envelope and its spectral composition influence the drawing. Formally, the audio-visual machine is a feedback system in which the sound produced by the drawing can in turn influence the graphical machine in a kind of self referential way.